How close can my patio be to my neighbour’s fence? Prepping for a new patio? Great but are you worried about how close can you get to your neighbour’s fence? You want to extend your patio as much as you can but you don’t want to get into trouble. You know you can’t come close enough to your neighbour’s fence as it might mean invading their privacy or worse breaking the law. How close you can build to your neighbour fence depends on where you live and the regulations governing your area. How close can your patio be to your neighbour’s fence? Under the governance of the Residential Design Codes of Western Australia, you can maximise your space but make sure your patio columns and roof must not be closer than 1.0m from your neighbour’s fence. It is also possible to build your patio up to 500mm from the fence, only if you obtain a signed consent from your neighbour. Or, you can have your patio columns right next to the fence, as long as the roofline remains 500mm off the fence line. In urban and rural areas the requirements will be different so it’s best to contact your local shire council to get the correct stipulations. If you are having a full installed patio build for you the installer will do this for you. What if you still want your patio built closer to the fence? If your plan patio requires more than that of the allowed 1.0m or the 500mm with signed consent, this will require you to have a building application and expect to pay additional cost for it. For more enquiries, check with your local council or hire a patio installer to do the job for you. They will know how close you can get to your neighbour’s fence without breaking any law. Other things to consider when building a patio? For your patio needs, contact CPR Outdoor Centre. We can do everything to erect your patio – from planning, designing and complying with the area’s building requirement. Just call us and we’ll do the rest for you. All our quotes are free. 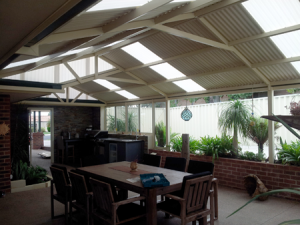 Your patio people in Bunbury, Busselton and surrounding areas!